Guests and company representatives gathered at the offices of WishBone Medical in Warsaw Monday for a ribbon-cutting. Among those pictured are Nick Deeter, holding the scissors, and Marlin Stutzman, to his right. Deeter is the founder of the company. Stutzman, a former Congressman, is company president. Photo by Dan Spalding. A close-up look at one of the trinkets passed out following a ribbon-cutting for the new orthopedic company, WishBone Medical Inc., in Warsaw. Photo by Dan Spalding. How did former Congressman Marlin Stutzman end up as the president of a new orthopedic company in Warsaw? The answer to the question starts with Howe, the small town where Stutzman resides. It’s also the home of Howe Military Academy where Nick Deeter serves on the board of trustees and where one of his sons studied. Deeter, the founder of several orthopedic companies, and Stutzman became friends in part over their work together at Howe. The convergence of opportunities began last spring when Stutzman, a three-term 3rd District Republican Congressman, lost in his primary race for U.S. Senate to Todd Young. Stutzman said he was driving to Washington, D.C., last fall when he got a text from Deeter who alluded to a new company he was launching called WishBone Medical. “Right away, I kind of knew what he wanted to do because the name of it,” Stutzman said. Stutzman was named president earlier this year when Deeter announced WishBone Medical Inc. would compete in the growing pediatric orthopedic market. Stutzman brings two specific traits to the company, Deeter said. Deeter also sees Stutzman as a formidable voice in “maneuvering though Washington,” and noted that he’s friends with Dr. Tom Price, who was recently named secretary of Health and Human Services, which oversees much of what the orthopedic industry does. Deeter credits Stutzman for his work in trying to repeal the medical device tax. Deeter, a former Zimmer employee who went on to found OrthoPediatrics and had a major role at Nextremity Solutions, had been assembling his plan for a new company for more than a year. 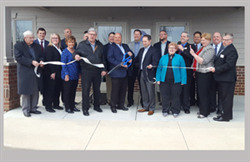 On Monday, WishBone hosted a ribbon-cutting with Kosciusko Chamber of Commerce with numerous local dignitaries at the company’s offices on North Pointe Drive, Warsaw. After a ribbon-cutting outside, guests then gathered inside in a conference room and heard a recap of the company’s mission by Deeter. 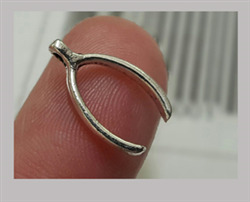 The company distributed small wishbone trinkets that help underscore how the company’s work focuses on small bones. Mayor Joe Thallemer congratulated Deeter and his company for choosing to locate in Warsaw. Deeter said he believes the company is positioned to carve out a share of the emerging pediatric market in which the chief rival is OrthoPediatrics, which he helped found. On Monday, among the many aspects of the company that Deeter pointed out, were the company’s interest in developing absorbable implants. Such innovations could prove to be the “Holy Grail” for orthopedic pediatrics because the Food and Drug Administration requires implants in children to be eventually removed. The products involve screws, plates, pins and wires, he said.